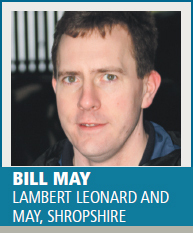 Bill May of Lambert Leonard and May in Shropshire says while a single clinical case of milk fever may cost around £200, the full impact of subclinical or clinical hypocalcaemia (milk fever) on health and fertility performance is more significant – see chart. and not contract as it should (uterine inertia). This can result in dystocia (difficult calvings) or prolonged calvings, which could lead to the need for more assistance at calving – a known risk factor for fertility problems later on. If uterine involution is delayed, there is an increased risk of retained placenta and an increase in bacterial contamination of the uterus, leading to metritis and endometritis. The effects of endometritis on subsequent fertility performance are well understood, and working with your vet to identify cows with post-calving problems to limit these will always be beneficial. Hypocalcaemia directly reduces rumen contractility post-calving and this, together with the increase in post-calving ill-health associated with hypocalcaemia, reduces feed intakes. A reduction in feed intake worsens the post-calving energy status and, along with ketosis, has a strong negative influence on fertility. 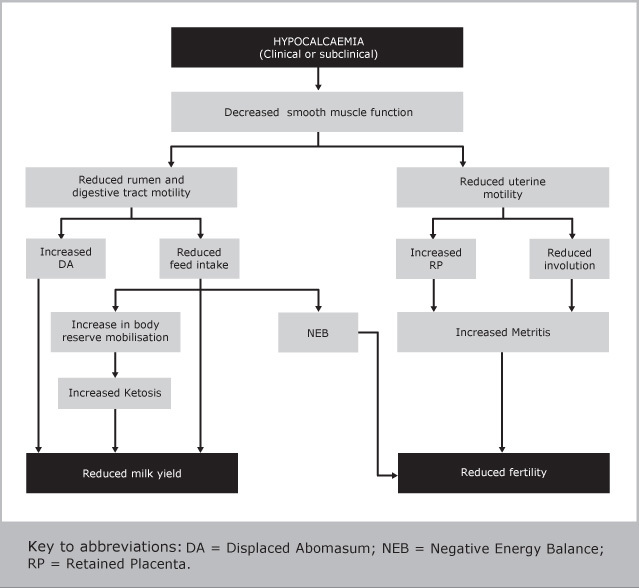 This can lead to increases in calving-to-conception and calving intervals. Studies have shown cows with subclinical hypocalcaemia ovulate later than cows with normal calcium levels. Milk fever is a risk factor for ketosis, displaced abomasums (DA), mastitis and lameness. More generally, it is well documented that cows suffering from one transition disorder are at a greater risk for contracting others, including conditions seemingly unrelated, such as mastitis and ketosis. The transition from gestation to lactation dramatically increases requirements for energy, glucose, amino acids and other nutrients in dairy cattle. Simultaneously, feed intake is often depressed. 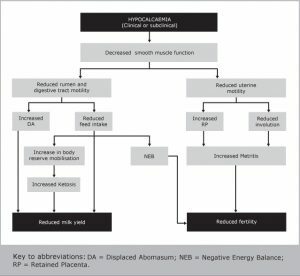 The resulting negative energy balance suppresses immune function and promotes metabolic disorders, potentially explaining the relationship between infectious and non-infectious disorders. Recent research has highlighted the role of inflammation in infectious diseases, and has suggested it may also be involved in metabolic diseases, possibly explaining some of the links between this diverse group of related post-calving problems. This may go some way to explaining the seemingly odd ‘epidemics’ of retained placentas, metritis or endometritis that occur on individual dairy farms, without the presence of the recognised ‘risk factors’ for these conditions. Such retained placenta outbreaks are often put down to nutritional factors (which may have altered once an investigation into the problem has begun), such as inadequate access to forage, a change in proportions of grass and maize forages, a change in the forage clamp, or inconsistent mixing or presentation of feed. On some farms, it is possible that subclinical milk fever could play a part in these outbreaks without the stockman being aware. Regular monitoring of herds to assess their ‘at risk’ status for milk fever would seem sensible in order to control this metabolic condition and other related diseases. Preventing milk fever will reduce herd health issues, some of which you may not have even been considered to be linked to calcium levels. It will save time, effort and money in the long run, and the calcium bolus Bovikalc is a good option used routinely for cows that have calved three times or more, or those with a history of milk fever. Bovikalc boluses can be used for reducing the risk of milk fever around the time of calving and following treatment of a clinical case to reduce the risk of recurrence. Speak to your vet for further advice and information.